For folks who have lost their grandmothers, I warn you, invest in some tissues before you read this post: The new favorite book in our household is an ode to grandmothers. Penny Love by Lisa Soares Hale is a simple love story, the tale of a little girl who finds a penny on a walk with Grandma only to spend the rest of her life picking up lucky coins along the way. With a penny love jar for the coins she finds, the little girl grows up and finds her collection growing too. When Grandma is gone, the jar is still there, a shining reminder that Grandma's love is too. Pennies get a bad rap - you know the old saying, like a bad penny . . . ? Sometimes, always turning up is what Grandmas do best, they're a constant in kids' lives even when they're gone. Penny Love is a story for every Grandma to buy her grandkids, and for grandkids to buy Grandma this year. Just make sure you wrap it up with a penny to start their collection. 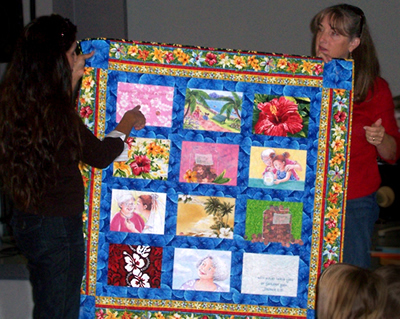 A wonderful surprise as a Penny Love reader and professional quilter Cari Apostle presents the author, Lisa Soares Hale, with a handmade one-of-a-kind Penny Love quilt. Hello, my name is Kevin and my mom (Julie) brought home two copies of your book and told me to read it. Now, I'm 15 years old, so I thought, "Psh, its just a picture book," and blew it off. The days moved on and there the book sat, on the coffee table. One day, I decided I'd read it, just for fun. I really liked it. It is such a great story. I just wanted to give you some feed back and tell you that it is a really fun book and I enjoyed it. Hi Lisa, We're back from our vacation as of tonight and I wanted to send you a note right away to thank you for the signed book for "Sophie's Nana." My mother in law was thrilled and read it with Sophia and now they have this special tradition together. So wonderful for them as they do not see each other often as "Nana" lives in Oregon. I'm sending along the pictures of Sophia and Nana making the penny jar together that Sophia called "Penny Love." It now sits in her room with a few pennies in it -- as it fills throughout her life, this will be a special memory and connection for the two of them. Thank you for your book! This book about a grandmother's love for her granddaughter transcending through generations could well be the next classic, Love You Forever. After reading this beautiful story of a grandmother's love for her granddaughter shown through a small, copper penny, I not only purchased copies of Lisa's book for my own grandchildren, but made them Penny Love jars to collect them in. I know that I will never again look upon a penny in the same way. ...the family (grandparents & great grandparents and aunts) have been asked to bring a special book to start her Children's Book Library. Well, not just any book would do for me. So I got on the internet and started looking. It took me hours. I look at every website... As soon as I read your description and saw the book I knew Immediately this was the one I had to have. I have also found an "old" green mason jar that I will paint "Penny Love" on to give to her as well. Penny Love is a wonderful book! In the story, a grandmother tells her granddaughter that each time she finds a penny, she should remember that her Grandmother loves her. 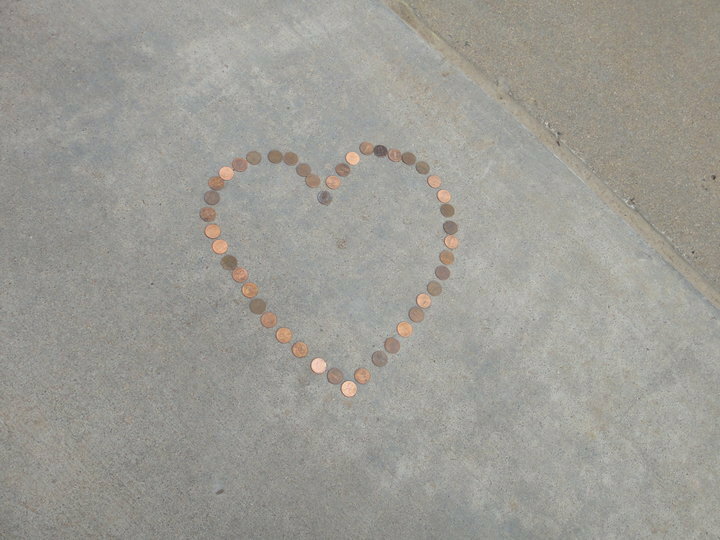 This is such a warm story, reminding us that the relationships we have with people we love are such a wonderful treasure, and how the simple act of finding a penny can be a tangible reminder of love. The story is well written, and beautifully illustrated. Thanks for such a wonderful book! Beautifully written and illustrated book about a little girl whose grandmother tells her that everytime you find a penny, it means 'I love you.' The book takes you through her life, as she finds pennies and remembers her grandmother's love, until one day she shares it with her own granddaughter. My mother-in-law, who lives out of state, read this book to my 9-year old daughter. They both then made a 'Penny Love' jar together. Now, my daughter has a tangible expression of her Nana's love every time she finds a penny. Purchasing a copy of "Penny Love" after seeing its debut at a convention was a great move. I gave it to my Mom to share with her precious grandchildren on a regular basis. I believe it will be the start of a sweet family tradition - one that will be passed down through the years. This book is a great reminder of finding love in 'the little things'. 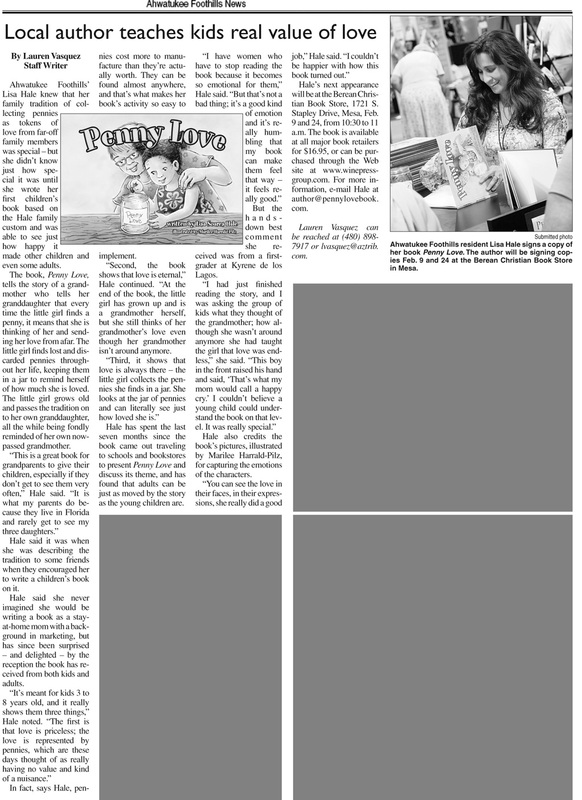 A cousin having the first grandchild on that side of the family - "Penny Love" provides another great opportunity to share a tradition-builder with my Aunt...who will make a wonderful penny-loving Grandma. Now purchasing another copy for me is also a great move! I am ready to begin this tradition with my own grandchildren when the time comes. My 5 year old daughter loves reading this book over and over again. With her Grammie living on the opposite coast, the penny has now become a constant reminder of her grandmother and the love they share. Whether young or old, you'll find yourself relating to the characters in the book. It is definitely a book that can be passed on through the generations. This book is a precious story of love and generations -- grandmother and child. It has outstanding artwork that would be appealing to any child. A great story with an 'action' suggestion at the end... And it is perfect for a Grandmother to read to her grandchildren and begin the tradition in the story with her own grandchildren. This is a delightful, heart-warming story about unconditional family love. 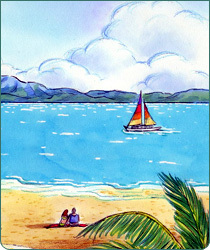 The illustrations are bright, cheerful and match the story perfectly. It also calls to mind your own sentimental memories of years gone past. It is simply touching and a must-have in your home. This book was very special and close to the heart. The love of Grandparents and how uniquely they express their love is so apparent. I too will never look at a penny the same again! "Thank you for such a wonderful treasure that will transcend generations to come. In our fast-paced and disposable world, a true keepsake is hard to find."